Welcome to the WUSV 2013 event page for Robyn Edgbert Photography! 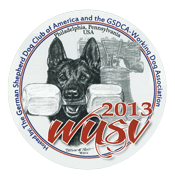 Robyn Edgbert is a member of the SV, GSDCA-WDA and GSDCA and is an "unofficial" photographer for the WUSV 2013 event in Philadelphia, PA, USA. Please feel free to browse the photos of the event and if interested in making a purchase you may do so on the SmugMug site. If you have any additional questions please use the "Contact Webmaster" link below to submit an inquiry. I will be uploading photos as early as my return home from the event and it will take some time to do so. Please bear with me as there are a lot of photos. I will update this page with status as I upload each country's photos.